This KitchenAid Artisan® stand mixer has a tilt head design and a five quart glass mixing bowl, capable of mixing dough for up to nine dozen cookies in a single batch. The planetary mixing action hits 67 points around the bowl with each rotation for thorough and complete mixing. It has 10 speeds, from a slow stir to a fast whip, controlled by a side lever and also accommodates additional accessories on the front-mounted attachment hub. 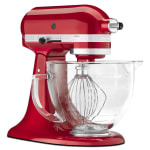 Artisan® Design Series 5-quart mixer, 10 speed, tilt back head for easy access to mixture, 59 point planetary mixing action, attachment hub, includes burnished flat beater, burnished C-dough hook, 6-wire whip, glass mixing bowl. 325 watts, 120v/60/1ph, Candy Apple Red. Warranty not valid when used in commercial environment.